From behind a bank of dark clouds, straight beams of light rise and fan out into lucent gold shards that reach across the horizon. It’s a new day, complete with a silvery lining on the edge of storm clouds. I know it's the oldest cliche, but it really does seem like yesterday, when I was rocking babies, mopping up their messes all while stepping over hills of dirty clothes. People tried to tell me how those sleepless nights would soon be a thing of the past and the screaming toddlers were just a phase too. They made sincere comments on how the adolescent years would rush by and the teenagers would leave home before we knew it and maybe even pay for their own cell phones and car insurance. They were right after all. It was just one fleeting stage after another where I had daily opportunity to impact my children's lives, for good or for bad. That was some of the most important work I've been given and I nearly missed it by thinking about the some-days, instead of hitting a rhythm of living in the day. Even this week, as I've found myself in a fresh new season of life, my days were often eclipsed by thoughts of "someday." "Someday I'll get caught up." "Someday I'll feel rested and get up earlier, so I can read and exercise before breakfast." "Someday I'll actually eat breakfast." "Someday I'll call that person that I've thought of countless times." 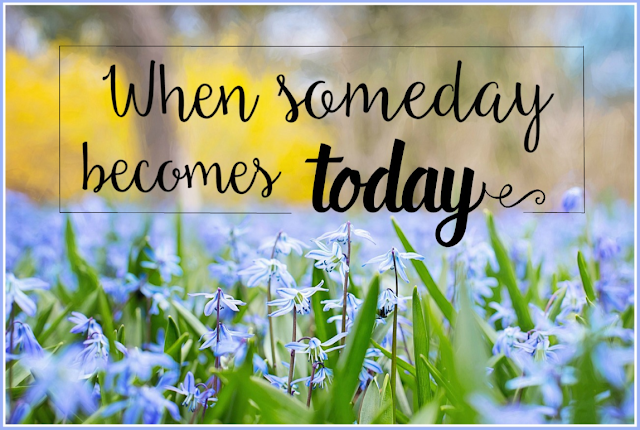 I found it a little disturbing to read how many people won't have a someday when tomorrow comes. Over 100 people die in our world every minute. Conservative numbers suggest that each day, 150,000 people will not have another day to stop wasting. Life is not an endless supply of days. It just isn't. Today is a gift and our days are numbered, so how do we start living like we believe that? Well, I believe that the answer can only be found as we individually seek the Lord earnestly for what His plan is. God doesn't usually unfold a spreadsheet plan complete with bullet points, but He does have plans for each and every person that will effect eternity. The crazy truth is, what we do individually, is linked together in the whole large work that God is doing in this world. I don't know how it all works, I just know that it does. And those nagging little dreams that poke at our heart? Those are often the clues to your destiny that God has for you and we need to take one step on the path toward them today, not some day. Every tiny choice sets us up for the next choice and moves us toward the destiny He has for us. My ideas for living well today aren't a grandiose list really. I think it's more about committing to what I'm becoming. It's more about being obedient to the small thing right in front of me as I make more room in my life for the things that make up the bigger picture of life. This year my word is deeper. So far it has looked like going deeper in the Word. Engaging in deeper conversations. Listening instead of talking. Praying instead of complaining. Responding with sincere concern and love to people who don't treat me with love or respect. Sometimes, its as simple and hard as allowing someone to go first in an already long line or giving an overworked cashier an earnest compliment. Deeper is going slower. It is doing less of the busy stuff, more of the heart stuff. That may not sound like an earth shaking purpose, but kindness and gentleness is a heart-shift that happens one kind, gentle act at a time. All around us are people who need a whole lot more of those things and maybe it really could change the world. Anything we want more of in our lives will come from doing more of it and less of something else. We should all be trying to figure out how to hold the pieces of our lives closely that God has given us to do. It's living on purpose –for the very purpose we were made for. That sounds more daunting than it is really. It is only overwhelming when we worry about the 'some days' instead of just doing what we have been given to do today. Trust me when I say this, going to another meeting, event or vacation is not as important as making time to be present for in our lives that are closest to us. Such as our spouse, our children or our neighbors. Living for today is not an all out, do every crazy thing you ever thought of. Living today well is making a commitment to become more of who God made us to be. Living well today is not what we do but who we are. It is not a passive process. Who God made us to be will demand more of us than we have to give. God is in the business of using people whose skills do not match the demands of His assignment. Most often, God is looking for people whose passion to live for Him exceeds any list of credentials, balance in the bank or social position. This living well today, is an unpredictable balance of allowing things to happen and making things happen. We can't orchestrate every aspect of the day, but we can embrace the moments and recognize God in them. That's how we stop merely marking out time until the next event or weekend or payday. When the sun sinks into the western horizon, another day will be gone. So today we look for God in our moments that gather into the day we've been given. If this were your last day on earth, do you know Jesus?